Hey guys!! Head over to my collaborative blog, All About 3rd Grade, to enter to win this Superhero Classroom Decor pack TODAY! 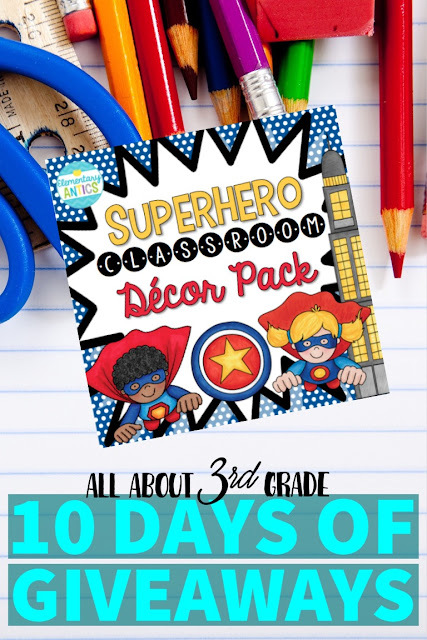 This decor pack has practically everything you need for a Superhero theme classroom! The file includes 150+ page PDF document and a 27 slide editable PowerPoint. Plus, while you're there be sure to enter our $50 TpT Gift Card giveaway too during our 10 days of Giveaways!